A recap of last night's Montreal/Toronto game. The Montreal Canadiens showed just how bad the team is this season as the Toronto Maple Leafs blanked the Habs.last night 4-0. Despite the loss, Montreal's goalie, Charlie Lindgren, had a really good night in net. Lindgren stopped 45 shots last night. William Nylander opened the scoring at 16:01 of the first period. Kasperi Kapanen put the Leafs ahead 2-0 just three minutes into the second period. With just 29 seconds to go in the same period, Nazem Kadri scored. Andreas Johnsson scored his first ever NHL goal at 15:27 of the third period. 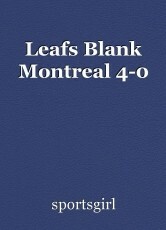 Leaf's goalie, Curtis McElhinney, stopped 33 shots last night. Toronto now travels to Tampa Bay to face the Lightning on Tuesday Night. This page was created in 0.4873 seconds.